Ornamental grasses can be split for a number of reasons: to create new plants; to renew a stand of grass if some parts have died; to relocate or add grasses to another part of the landscape; or to stimulate the plant after winter damage. While splitting ornamental grass is not hard, you must work quickly and efficiently, because the plants will suffer if their roots dry out. Work on an overcast day and avoid splitting grass in hot weather. Wait until your ornamental grass resumes active growth in the spring. You can divide ornamental grasses from the spring to early summer and then again in the fall. Avoid splitting grasses during the heat of midsummer. Cut your ornamental grass back to a height of 4 to 6 inches above the ground (if you did not trim back your grass in the fall). Dig your ornamental grass from its current location using a small trowel. Dig underneath the plan, scooping up the roots. Pull up the ornamental grass clump and roots; it should come out of the ground easily because grass has fairly shallow roots. Split the clump of grass into pieces using a sharp spade or knife. The Garden Helper recommends driving one spade into the clump of grass, then driving a second spade in so the two are back to back. Push the spades together with your hands to divide the grass into two clumps. Repeat this to divide the two clumps in half. Continue until you have as many grass plants as you want. 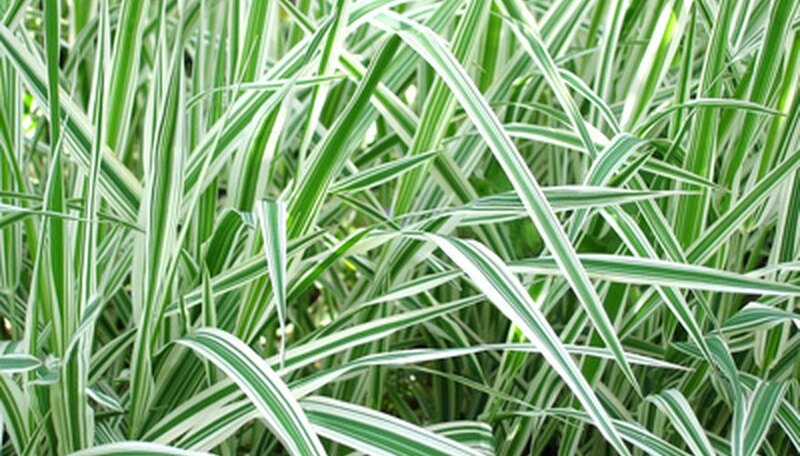 Pull off any dead grass blades with your fingers or cut them off with clippers before planting the ornamental grass. Dig holes for the new grasses that are twice the width of the grass clump. Place one clump of ornamental grass in each hole. Fill in the hole to plant your ornamental grass. Water the grass to compress the soil.